INDIAN ECONOMIC AND SOCIAL HISTORY REVIEW covers the histories, economies, and societies of India and South Asia and includes comparative studies of world development. 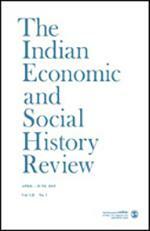 For over 50 years, Indian Economic and Social History Review has been a meeting ground for scholars whose concerns span diverse cultural and political themes with a bearing on social and economic history. Indian Economic and Social History Review is the foremost journal devoted to the study of the social and economic history of India, and South Asia more generally. The journal publishes articles with a wider coverage, referring to other Asian countries but of interest to those working on Indian history. Its articles cover India's South Asian neighbours so as to provide a comparative perspective. Issues are periodically organised around a specific theme as a special number. The journal's principal features are research articles, substantial review articles and bibliographic surveys, which also cover material available in Indian languages, as a special feature.